I have been hearing a lot of good reports about Mama Mia Italia at Sainikpuri. It was good to see friends travelling all the way from Miyapur and Gachibowli to try out the wood-fired pizzas there. Somehow, the visit had been a long pending one for me and finally did not take place. The Drive-in food court fever has finally caught up in Hyderabad, and almost every week, a new drive-in is opening its door especially in the Cyberabad area. One of the better ones is known as The Street, which also boasts of a mini football field. There are about ten restaurants here, notable among which are Wich Please, Bade Miyan and Godavari Ruchulu. 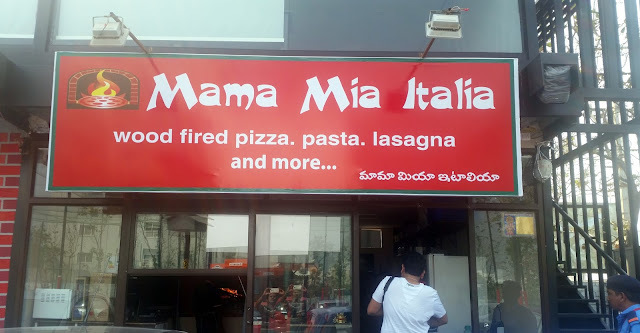 Mamma Mia has also shifted their outlet from Sainikpuri to this new food court. On an invite from the owners of Mama Mia, a few bloggers attended a tasting session on a summer afternoon. I had missed the inauguration of The Street due to some other engagements, and was looking forward to this meet. The food court in The Street has ample air cooled seating upstairs. A Watermelon Cooler helped me settle down, and soon the items for tasting started coming out of the kitchen. First to arrive were couple of versions of Garlic Breads – with and without cheese. 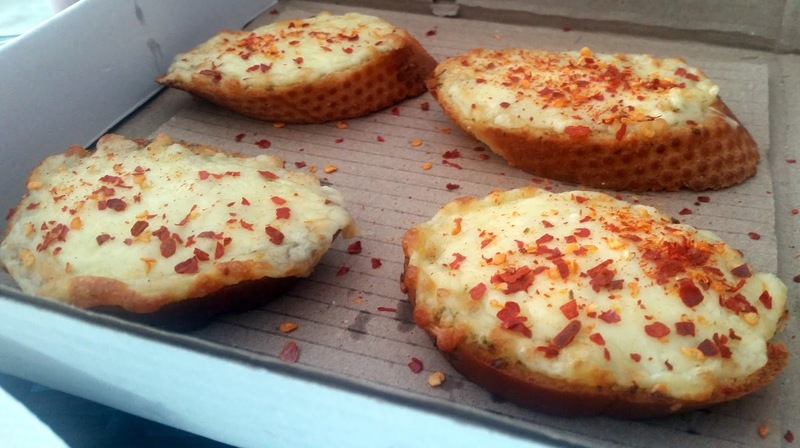 The Cheese Garlic Bread tasted good, we sprinkled some chili flakes on top to make it spicier. Italian Chicken Bruschetta, which had a topping of bite-sized boneless chicken pieces in melted cheese was next in, and was just as good. 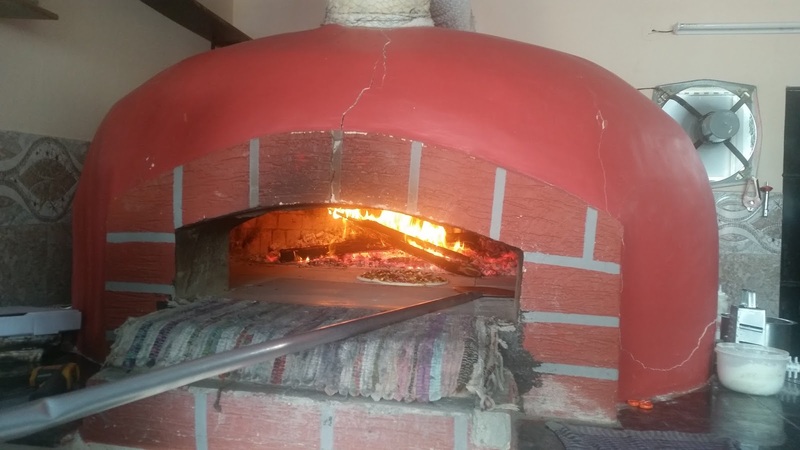 Mama Mia makes all their breads in-house. We left the choice of pizzas to the Mama Mia management so that they could showcase their best stuff. Among the three of us, one was a vegetarian, so an assortment of veg and non-veg pizzas were prepared. 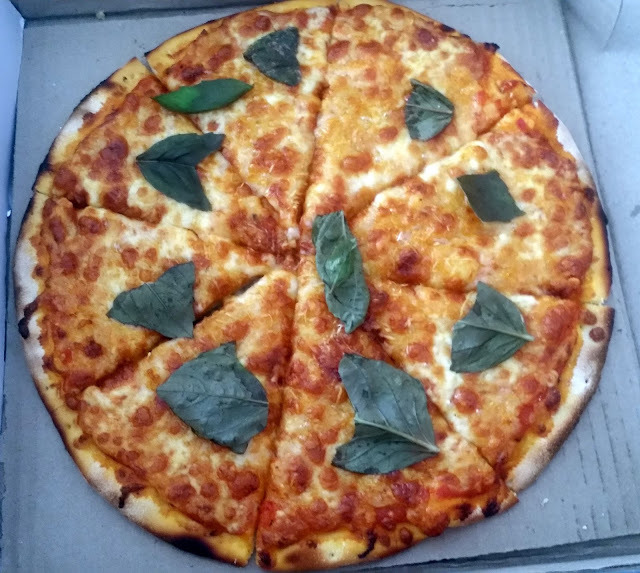 My pick of the lot was the plain vanilla Margherita Pizza, the pizza which lets you judge the quality of the base as well as the cheese toppings. We were not disappointed with the offering, especially the topping was ample and delicious. One must commend the place for the quality of their cheese varieties. I was also impressed by the Mama Mia Special Veg Pizza. 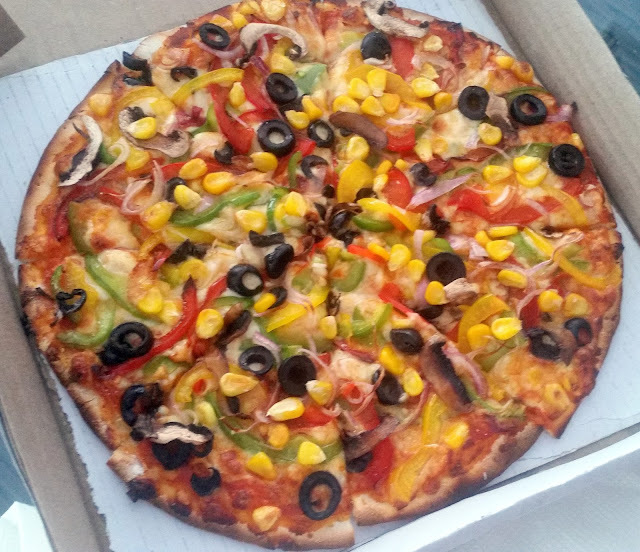 It again had a fairly thick topping of corns, black olives, tomato capsicum and lots of cheese. The ingredients were assembled in just the right quantities – no single taste overwhelmed the others to present a very balanced pizza. The Pepperoni Pizza made its arrival known by its unique aroma. However it was slightly more salty that it normally is. 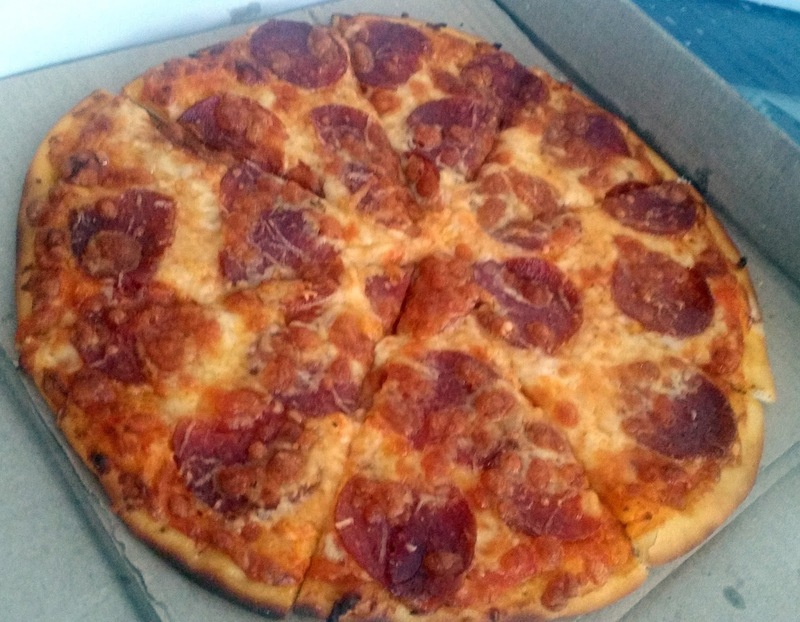 What I liked here was that unlike some other places, good quality pepperoni slices were used and in ample quantity. The other non-vegetarian offering was Italian Chicken Pizza which had a rich topping of tomato, capsicum and olive among others. Nothing mind-blowing, though here again they did not go overboard with any ingredient. A fine balance seems to be the hallmark of the pizzas of this place. I had a look at their menu. Apart from the regular stuff, they also have fusion pizzas with tikka and Szechuan toppings. There are also a few pastas and lasagna which I will try on my next visit. 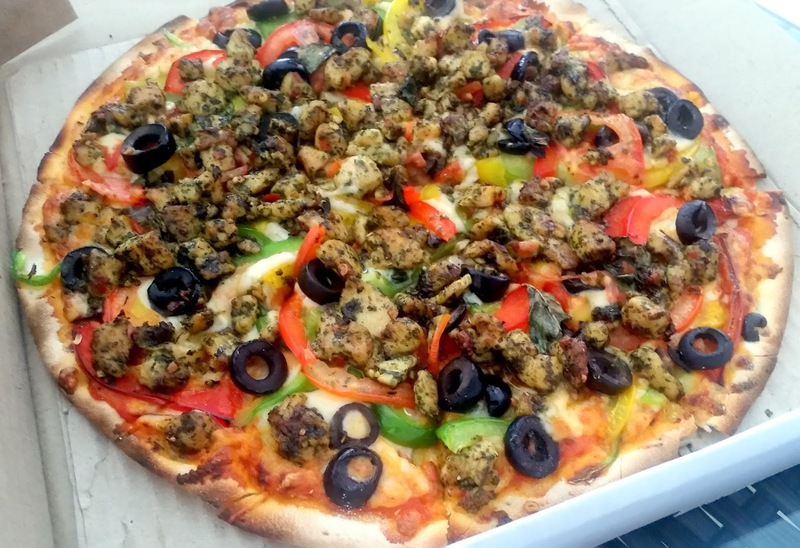 The pricing of the pizzas (7 to 12 inches) ranges from Rs 100 to 450 for veg and Rs 200 to 550 for non-veg. They have a couple of choices of panna cottas for dessert. Mama Mia is open from 12 noon to 2 am at night. Apart from a quick lunch or dinner, this might be a good place to satisfy late night hunger pangs. The place has plans to introduce a complete English breakfast with sausages, ham, baked beans and organic coffee in the next couple of months.